Do you have a broken or chipped tooth? If so, there’s no doubt that you’re feeling self-conscious about your smile. The truth of the matter is that you need a solution that will drastically improve both your smile and your self-esteem. You need a Fairfax dentist to repair your broken teeth. Well, here at our dental office, we would love to be those dentists! Our dentists have the tools and several options when it comes to broken tooth repair. Allow our cosmetic dentists to show you exactly how they can improve your smile with either porcelain crowns or porcelain veneers. Here at our office, we offer 2 main options when it comes to repairing your broken teeth. These options are porcelain veneers and crowns. Our cosmetic dentists will help you determine which solution will best fit your needs. One of the most viable ways to fix a broken tooth is with a porcelain crown. Porcelain crowns are versatile, and they have a variety of benefits. Porcelain crowns are custom-made to fit your needs, and they fit over your teeth giving them added strength and durability. In fact, we use the latest technology when it comes to applying crowns. First of all, our crowns are made of a durable porcelain which looks and feels natural. We also use innovative CAD/CAM scan technology, which renders the process of impressions of your teeth obsolete. This means that the process is faster, and will allow our dentists to custom-make your crowns in our office, ensuring a perfect fit. 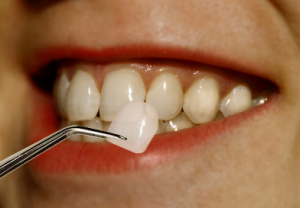 Porcelain veneers are thin porcelain coverings which go directly over the fronts of your teeth. They are not only a practical solution to broken teeth, they will also give your smile an added aesthetic. Porcelain veneers can be applied in as little as 2 to 3 office visits, and in many cases they do not require significant tooth alteration. In fact, these veneers are so natural and beautiful looking that our patients often opt for complete smile makeovers with veneers. If you have a broken tooth to repair, our dentists would love to help you! They will determine whether porcelain veneers or porcelain crowns are the right solution for you. They would love to speak with you about your smile problems, and help to determine which of these procedures is right for you. If you would like a complimentary consultation with one of our dental professionals, please call our office today at (703) 997-0928.